The NFPA 96 is the basis from which our certification is obtained. "Being Taught The NFPA 96 Standards by A Technical Committee Member Is The Only Way I Suggest That You Learn Them. This Way You Are Hearing Them Straight From A Person Who Is Actually Helping The Standards Be Formed." Here at Certified Hood & Duct Cleaners Association we teach and follow the NFPA 96 standards. To purchase the Most Current NFPA 96 standards click here. 11.4 Cleaning of Exhaust Systems Upon inspection, if found to be contaminated with deposits from grease-laden vapors, the entire exhaust system shall be cleaned by a properly trained, qualified, and certified person acceptable to the authority having jurisdiction in accordance with Section 11.3. 11.4.2 Hoods, grease removal devices, fans, ducts, and other appurtenances shall be cleaned to bare metal prior to surfaces becoming heavily contaminated with grease or oily sludge. 11.4.3 At the start of the cleaning process, electrical switches that could be activated accidentally shall be locked out. 11.4.4 Components of the fire suppression system shall not be rendered inoperable during the cleaning process. 11.4.5 Fire-extinguishing systems shall be permitted to be rendered inoperable during the cleaning process where serviced by properly trained and qualified persons in accordance with Section 11.3. 11.4.6 Flammable solvents or other flammable cleaning aids shall not be used. 11.4.7 Cleaning chemicals shall not be applied on fusible links or other detection devices or the automatic extinguishing system. 11.4.8 After the exhaust system is cleaned to bare metal, it shall not be coated with powder or other substance. 11.4.9 All access panels (doors) and cover plates shall be replaced. 11.4.10 Dampers and diffusers shall be positioned for proper airflow. 11.4.11 When cleaning procedures are completed, all electrical switches and system components shall be returned to an operable state. 11.4.12 When a vent cleaning service is used, a certificate showing date of inspection or cleaning shall be maintained on the premises. 11.4.13 After cleaning is completed, the vent cleaning contractor shall place or display within the kitchen area a label indicating the date cleaned and the name of the servicing company, and areas not cleaned. 11.4.14 Where required, certificates of inspection and cleaning shall be submitted to the authority having jurisdiction. 1.3.2 The authority having jurisdiction shall determine compliance with this standard and authorize equivalent deviations from it in all applications. 3.2.5 Shall. Indicates a mandatory requirement. 3.3.40 Solid Cooking Fuel. Any solid, organic, consumable fuel such as briquettes, mesquite, hardwood, or charcoal. 4.1.8 All interior surfaces of the exhaust system shall be accessible for cleaning and inspection purposes. 6.2.3.3 Grease filters shall be arranged so that all exhaust air shall pass through the grease filters. 14.1.6 Solid fuel cooking operations shall have spark arresters to minimize the passage of airborne sparks and embers into plenums and ducts. 14.3.3 All solid fuel cooking equipment served by hood and duct systems shall be separate from all other exhaust systems. 14.5.2 If airborne sparks and embers can be generated by the solid fuel cooking operation, spark arrester devices shall be used prior to the grease removal device to minimize the entrance of these sparks and embers into the grease removal device and into the hood and duct system. A.3.2.2 Authority Having Jurisdiction The phrase is used in NFPA documents in a broad manner, since jurisdictions and approval agencies vary, as do their responsibilities. Where public safety is primary, the authority having jurisdiction may be a federal, state, local, or other regional department or individual such as a fire chief; fire marshal; chief of a fire prevention bureau, labor department, or health department; building official; electrical inspector; or others having statutory authority. For insurance purposes, an insurance inspection department, rating bureau, or other insurance company representative may be the authority having jurisdiction. In many circumstances, the property owner or his or her designated agent assumes the role of the authority having jurisdiction; at government installations, the commanding officer or departmental official may be the authority having jurisdiction. A.3.3.22.1 Grease Filter. Filters are expected to minimize the projection of flames downstream when attached by flame on the upstream side and are expected to maintain their strength, shape, and integrity when exposed to the anticipated rough handling, cleaning, and service found in the field. A.3.3.22.2 Mesh-Type Filter. This type of filter is not tested, listed, or acceptable for commercial cooking operations due to the increased fire hazard. 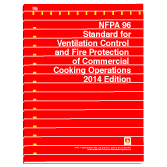 * Reprinted with permission from NFPA 96 Standard for Ventilation Control and Fire Protection of Commercial Cooking Operations ©, National Fire Protection Association, Quincy, MA 02269. The reprinted material is not the complete and official position of the National Fire Protection Association, on the referenced subject which is represented only by the standard in its entirety. IMPORTANT: This is an excellent reference manual. Purchase of this book is strictly optional, but it is recommended for those who are serious about this as their career.